Dr. William "Billy" Tate recently established The William Tate, M.D. International Piano Series Endowed Fund in support of the College of Charleston's piano program, announced Edward Hart '88, College of Charleston Music Department Chair. 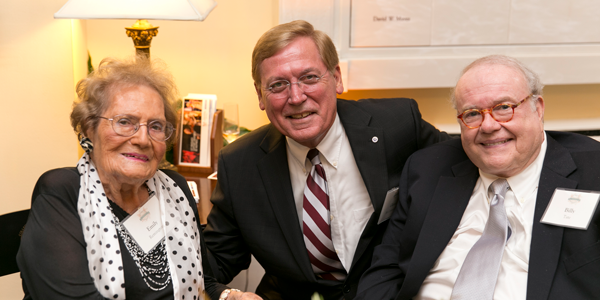 "We are profoundly grateful for the generosity of our longtime friend, Dr. Tate," says Hart. "This generous gift will sustain our acclaimed piano program for many years to come." The College of Charleston International Piano Series annually hosts four world-class artists, who each perform a concert. In addition, the College holds masterclasses for students who play for and are coached by the concert pianists. "It is almost an unheard of opportunity for undergraduate students," says Hart. A lifelong lover of music and retired dermatologist, Dr. Tate has championed Charleston's music scene since it achieved national prominence four decades ago. Dr. Tate had a front row seat when in 1976 visionaries including Mayor Joseph P. Riley, College of Charleston President Ted Stern and Spoleto Festival USA founder Gian Carlo Menotti worked together to elevate Charleston as a music destination. Following the transformative launch of Spoleto Festival USA and the Charleston Symphony Orchestra, the College of Charleston founded its dynamic music program, which merges the intense focus of a conservatory with a liberal arts and sciences education. In 1987, in recognition of his good friend, organist and choral director Emily Remington and the integral role she played in bringing music to the College, Dr. Tate established the Emily Remington Master Artists Series Endowment. Through his generosity, the College hosts the finest musicians and teachers at the campus for concerts and classes. Dr. Tate's newly established $1.14 million endowment will continue his positive impact on the College of Charleston music program by ensuring the success of the piano program for generations to come. The gift will continue Dr. Tate's support for the International Piano Series and all College of Charleston piano programs, including awards for piano students along with equipment acquisition and maintenance. "I have had the opportunity to watch Charleston and the College grow into music destinations," said Dr. Tate. "I have enjoyed many fabulous concerts at the College of Charleston, and I look forward to many more. Now the superior quality of music offered in our great city will span generations."